Hannah Johnson is a lady in a man’s clothing. Orphaned at a young age, she is forced to take over her father’s livery to survive. She works hard to save enough to buy a house of her own. When the bank in her town is robbed, she has only one choice—go after the money herself. 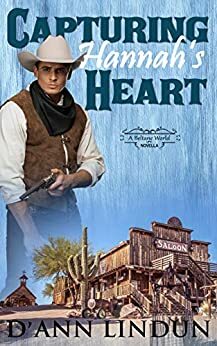 Roan Maxwell rides into Beltane, Arizona, looking for a bed for the night, but instead gets a bullet in the back during a bank robbery. Afraid folks will think him one of the robbers, he flees. When Hannah stumbles over him, he’s rather her think him a robber than yellow bellied. Can these two learn the truth about one another, catch the robbers and fall in love, too? I read Capturing Hannah's Heart when it was featured in Five Roads From Beltane. I loved Hannah and Roan's story. D'Ann's characters are always well written and her stories are engaging. Sweet story, easy to read in an afternoon. Likeable characters probably not what to expect in real life but good for a romance.